Ah the door, an endless fascination to a little tot. Not only are they SUPER fun to swing back and forth, (and slam) they are magical because you are there one second... slam... now you’re not! It’s like Peek-a-boo for realisies. To keep the door from becoming your child's favorite play toy, there are a range of products available and although some can be on the flimsy side, they do help with some nasty safety concerns. Why the lack of great products? One major issue is there are just soooooo many types of doors: bi-fold doors, pocket doors, barn doors to name just a few. Then layer on their respective hardware like circle or round knobs, oblong knobs, lever style… and if you have older hardware… as my friends in New Jersey say… Fuggedabotit. Another big issue? Door safety is not just a phase from 6 - 24 months of age. Many children don't even have the dexterity to turn or move the knobs until older - and there are many cases of 3 or 4-year-old children making a break out of the home. Ah, and then those teen years, but that's a whole other blog series! The good news? As your child gets older they should, "theoretically," understand and respect your safety rules around the house. But, I'll just raise my hand and say we still work on this with our son and we don't bat near 1000 on following directions/rules (gasp!). Until we're in Followdirections Land, extra protection on the doors is a great plan. No that doesn't mean bubble wrapping all the doors, but it does mean following simple steps. As soon as your child starts crawling they will be making a b-line to the door and the first order of business? Slamming that door! Over and over and over again. And over again. 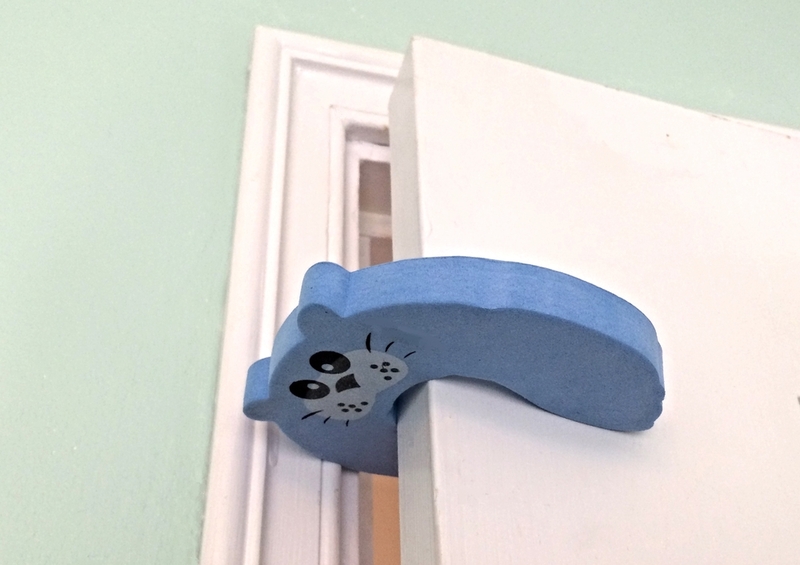 Door stoppers are a great option to prevent little (and big) fingers from Squishville. Most of these products are foam based and create a physical layer between said fingers and said door. The protectors range in aesthetics from clear and discrete to cutesie. Just know, as with all products, if you draw attention to it with bright colors and animal faces your kiddo will probably think it’s a toy. Mine did. Your kiddo won’t have pancake fingers. They are easy to install, use and remove without residue. You won’t be able to close your door without removing the product. They wear with age and can start to fall off. They don’t protect the hinge area (there are some products that do). Sliding/Pocket/Swing doors: Create a latch on the door frame or use a securing strap. To prevent some serious frustration, you should know that most people need to try more than one product before they find a winner. That's not great for your pocketbook to hear, but it's the honest truth. There are just too many door variations and door handles so try to only buy one piece to test it out before you outfit your whole home. A quick note on all the DIY suggestions all over the web: I know "hacking" is hot these days, especially when trying to save a penny, but please use your judgement. I've seen a range of suggestions from using a sock with a rubber band on the knob, cardboard covers, placing a washcloth in the door jam... these sounds great and cheap in concept, but these hack methods have not been put through the rigors of safety testing and can in fact introduce new safety concerns (ahem, rubber bands and kids don't mix!). Let’s face it, it is one thing if your tot is getting into your bedroom when you don’t want them to but it’s quite another when they are opening the front door and getting access to a street or public space. Being legitimately worried about a jailbreak isn’t for the tiniest members of our brood, Houdini kids may start gaining interest with the great outdoors after 2 years old after many parents are finished childproofing. When a kiddo is persistent about getting out the front door it’s time to take your proofing to another level, literally. I highly recommend installing a deadbolt or a security door chain (see picture) as high as you can because kiddos can move chairs around. Just make sure you don’t throw your back out every time the doorbell rings. Are you a renter? Please talk to your landlord. Not just about the doors but this is a great time to talk to them about the overall childproofing needs for your family. After interviewing many renter parents, I’ve found landlords are usually very supportive, unless they come from Planet Black Heart, then all bets are off. 1) Find the make of the door hardware, suggest the same brand or similar aesthetic so the hardware matches other parts of the kit. 2) If that doesn’t work… ask if you can use a hook and eye mechanism – these can be mounted on the door frame to the door. They are not as invasive and then can be repaired with wood filler and paint. Just note this won’t deter a break-in. 3) Not buying it? OK, how about an adhesive based strap? There is no drilling required but remember per the above, it will only thwart a tot, not a thief. Note that you will need two flat surfaces for the adhesive so if your front door frame is super stylized this option may not work. 4) If that landlord still isn’t budging… my goodness, I’m so sorry, your landlord sounds like a real winner. Try to find one last good bone in their body and appeal to the fact that your child’s general safety is the most important thing here – not some damaged paint. Think about it… a door (like a bathroom or bedroom door) that locks from one side, the side your child is on and you are not. Not. Cool. It TOTALLY happens. Sorry to be a major buzz kill. On some door knobs, they come with a pressure based unlock release. These can look like a small punch hole in the center of the knob or on the bottom side of the door handle hardware. You can many times use a tiny Allen Wrench (that Hex shaped tool you get with DIY furniture pieces), a very small screwdriver (like the eyeglass kit ones) or an opened clothes hanger to pop the lock. Basically, it needs to be a few inches long, thin but strong enough not to bend. Just make sure you don’t store your emergency lock-picking tool in the room that can lock. Just sayin. Do you have an older door lock? The best rule of thumb would be replacing with hardware that either doesn’t have a lock or has a release system. 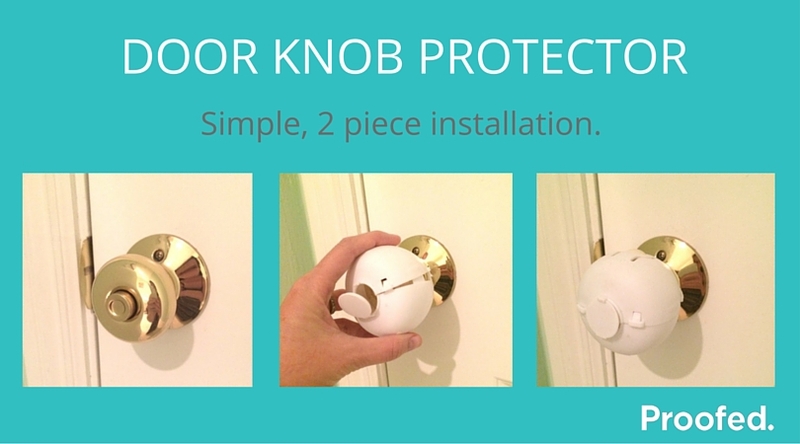 If that’s not possible block the door knob locking mechanism with a child proof door knob protector and place the protector on both sides of the door knob. This means the lock will not be operable but… I mean… let’s just be honest that any semblance of privacy in your home was squashed when your bundle of joy arrived. Word. OK, you did it! You now have the nuts and bolts (and knobs and levers) to go and keep your doors safe and sound. If you found this post helpful, please like the heart below and share on Facebook. Newer PostUm... Do I really need a baby gate?